Taking their name from a chemistry concept where multiple atoms are joined by sharing electrons is New York's progressive rock outfit Valence, offering their debut album Sleepwalker. The chemistry metaphor is a good one as these four musicians work well together creating some very good melodic progressive rock. Conversely, they deliver their prog rock in instrumental form which can sometimes be both elusive and inaccessible to the average listener. Valence overcomes this potential difficulty in two ways. First, the work from a strong melodic hard rock foundation and, second, Sleepwalker is essentially a guitar driven composition. With no disrespect to the rhythm section, which is exceptional, the guitars are at the forefront. Sleepwalker erupts with massive amounts of riffage and equal amounts crisp solos. If you guitar rock, progressive or otherwise, you will dig this work. Yet, there's a third characteristic which makes Sleepwalker entertaining, keeping your interest. This is simply the breadth and depth of the arrangements. 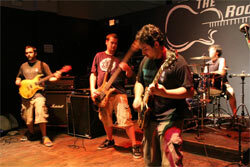 While the guitars are a big part, it's not all just a twin guitar attack ripping up their respective fret boards. No, each song moves with the ebbs and flows, twists and turn, that make progressive rock so intriguing. Valence does this often in very compact spaces as on Reborn from the Ashes, or longer Winds of Zephyr and The Depths. Fundamentally, in 34 minutes, Valence keeps your interest. Despite the album's brevity, it's only flaw, it probably shouldn't have been any longer, simply as not to become to tedious to your ears. 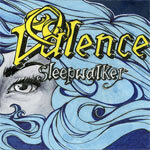 Valence's Sleepwalker is strong release, both entertaining and intriguing, and certainly a fine first achievement for the band. Recommended.